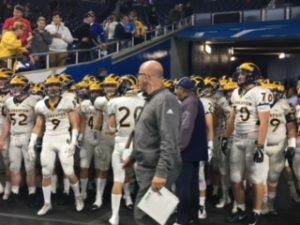 DAVISON (DTV)-(10/19/18) After playing for both Lapeer East and Wayne State University, Former Head Coach for Lapeer Jake Weingartz, finds himself coaching the Davison Cardinals in a new era of Davison Football. This season, the Cardinals won the season opener 28-6 against the Southfield A&T Warriors at Wayne State University. The following week, Davison shut down Bay City Western at Cardinal Stadium 49-0. Davison beat some huge competitors this year, such as Carman Ainsworth in week three 36-29, Powers Catholic in week four 50-20 and Grand Blanc in week five 49-7. In honor of Homecoming the Cardinals defeated the Jaguars of Flint High School 35-0. After a tremendous beginning to the season with a record of 6-0, Davison battled it out against the Warren De La Salle Pilots in Cardinal Country. After a long night of pouring all their efforts out on the field, Davison had their first loss of the season 35-7 in week six against De La Salle. In week seven, Davison headed out to Saginaw Arthur Hill and came back with a win 63-6. On October 19th, the Cardinals squared off against one of their biggest rivals, Lapeer High School, for their last game of the regular season. This game was bound to be an epic one, as Coach Weingartz faced his former team and the long standing rivalry with Lapeer. Davison unfortunately could not a secure a win, and lost 28-6. This great season would not be possible without Coach Weingartz leading his football team to success. His efforts on stressing sportsmanship, hard work and determination reflect what Davison is all about. DAVISON (DTV) – (09/19/2018) – Last night was the night for volleyball. Davison was neck and neck all night with Powers Catholic. During game 1 the team worked together well to bring the first game to a close with a defeat over the Powers Chargers, 25 to 20. With the roll around of the 2nd game Powers used their previous loss as fuel to get through this game, attacking the Cardinals with spikes taking that game away with 25 to 22. The Cardinals fought their battle with an intensity like none other but unfortunately couldn’t pull a victory through for the 3rd game as well as the fourth. Although in the last game they applied their biggest fight tying the game 3 times needing two points to win but Powers still ‘charged’ forth winning the final battle to end the game. Davison 1, Powers 3. It was a great night for the lady cards and we hope to see them push through the rest of the season! You can watch the game below. DAVISON (DTV) – (06/11/2018) On Monday night June 11th, starting at 7 at the Dort Federal Credit Union Event Center, the 2018 seniors will take their final stand as a Davison High School student. As they cross over their tassels and toss their caps, they say hello to a new chapter of life. If you would like to see the seniors walk the stage and gain their diploma but you can’t make it to the ceremony, DTV will be streaming the event live on our Youtube Page, DTV News. We will also air the event live on our Charter channel 191. There will be DVDs for sale at the arena. You can also make a purchase at PayForIt.net. DAVISON (DTV) – (06/14/2018) As the second week of June comes to a close as does the season for graduations. Noted above, you can see we had covered the DHS graduation on Monday, but if you’re looking for any other graduation you may have missed this week, whether it be the Cardinals Nest, or the Alternative Education you can find all we’ve got out and covered this week below! And if you’re looking to buy a DVD for any of these events you can still make purchases on PayForIt.net. Wednesday, June 6th, was the kickoff for the Davison annual Festival of Flags. The celebration started with a parade down Main Street. Several groups took part in the parade, including local police officers and firefighters, the Davison Knights of Columbus, and the DHS Marching Band and pom team. The festival is going on through June 12th. There will be tons of events such as carnival rides and even a talent show on Saturday June 9th. It starts at 2pm in the Lake Callis Grand Pavillion. You can register here. Any age can register and there will be prizes. Be sure to come support local talent! Winter sports are wrapping up and with that comes the spring season. Season tryout will all begin on March 12th here is a list of all the tryout times and where to meet. Boys golf at a still to be determined time in Ms. Stockers room. 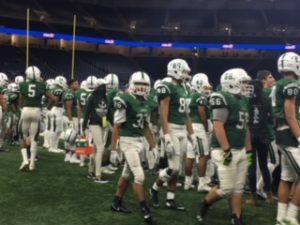 The Clarkston Wolves and the West Bloomfield Lakers face off at Ford Field for the division one state finals.The schools are not that far apart, about 20 minutes away from each other but they both meet up here in Detroit to battle it out For the division 1 state championship. Both teams are coming into this game with a record of 10-2. They played against each other earlier this year and West BloomField blew Clarkston out 37-16. All the more reason for Clarkston to come looking for redemption. The first quarter was a lot of going back and forth for each team, both were feeling each other out and trying to get a feel for the game. It is a very defensive game that is pretty messy and all over the place. But with a bad snap on a punt from Clarkston, the Lakers got a 2 point safety making the score 2-0 to Bloomfield. This game seems to be pretty unpredictable anything could happen and it could be anyone’s game. Clarkston started the 2nd quarter with a vengeance coming right out of the gate with a interception by Zach Scott . He picked off Bryce Veasey’s pass in the end zone stopping a Bloomfield touchdown. Then Trevor King fumbled at the 44 yard line, for Bloomfield’s second turn over of the half. With seconds left in the first half, Clarkston nailed in with a 30 yard field goal, set up by a complete pass by West Bloomfield’s Connor Heaton to. Then a roughing the passer penalty on Bloomfield. Ending the 2nd quarter with a score of 3-2 to Clarkston. The Lakers started out the 3rd quarter in control of the ball. Pushing though but Clarkston’s defense blocking them from getting anywhere. Clarkston then gains control for a while then Bloomfield again, a lot of back and forth still. Both teams really counting on their defense not a lot of offensive plays. A great play by West Bloomfield’s Bryce Veasley with a pass complete to Taj Mustapha who ran 52 yards into Clarkston territory, but they were forced to punt. Clarkston started the last quarter with the ball but west Bloomfield quickly got it back in their control, Clarkston getting a roughing the passer penalty after Bryce Veasley incomplete pass to AJ Abbott. With a great pass by Bryce Veasley to James Faulkner to run 23 yards for a 4th down. And another great pass by Bryce Veasley to Taj Mustapha who ran 9 yards for a West Bloomfeild first down . With 5 minutes left in the game the score still has not moved. With a little over a minute left in the game Clarkston’s Tieler Houston interception to wrap up the game declaring Clarkston the Divison 1 champs with an ending score of 3 to 2. During a Press Conference this morning at Virginia Tech, Mark Edwards, the lead scientist in the Flint water investigations announced that after 5 rounds of testing on the water of Flint, the levels have dramatically changed and have found themselves slightly below normal. They will continue to conduct tests on the water to make sure that it stays below normal levels and does not fluctuate, but for now, scientifically the crisis is over. The people of Flint have reason to be in doubt and Mark Edwards himself even believes it will be awhile before trust is restored between the people of Flint and their government but there is no denying that the trust has been depleted and the damage cannot be undone. DTV has been with the Crisis and we will still be as the entire thing unfolds.